This Easter weekend , the AFL are trailing players names , on the backs of football jumpers ,jerseys , guernseys. According to reports , from the games already played , this could be problematic . Some commentators have said the size of the name is too small. Further , those with long surnames eg Lewis Roberts Thompson , Sydney Swans legend , have had it abbreviated to LRS , making it largely unintelligible to all , but the most ardent of fans . Those with a three letter surname eg Farren Ray , St Kilda player , possess a name made for the back of an AFL Football Jumper , Jersey , Guernsey . Whilst it makes for easier identification , will fans be impressed ? 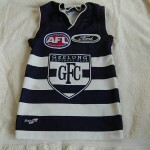 How many will trade their much loved , but nameless footy jumpers , jerseys , guerneys , in for named ones . What if their fave player is sidelined for a season due to injury , or worse gets dropped for poor form ! Will it label the wearer as a loser ? Can fans be outed , as wearing an out of date guernsey , when their player retires ! Will nicknames be used ? Many are more relevant to the player than his birth name ? What of vintage and retro footy jumpers ? nameless , but from an era of colloquial names eg: Captain Blood , the Galloping Gasometer or the Chimp ! 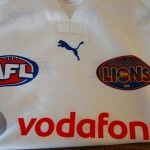 Certainly in other sports , EPL comes to mind , the naming of players on their footy jumper , jersey , guernsey , has been overwhelmingly successful .Are the AFL slow to follow suit , or are they just being more pragmatic in the ever evolving game of AFL Footy ? Will fans purchasing power decide ? This entry was posted on Saturday, April 19th, 2014 at 2:02 pm	and is filed under AFL, football jumpers, NRL. You can follow any responses to this entry through the RSS 2.0 feed. Both comments and pings are currently closed.